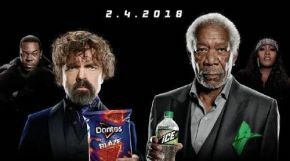 PepsiCo have unveiled their star-powered joint promotional advert featuring a rap battle of epic proportions between Morgan Freeman and Missy Elliott for Mountain Dew ICE, and Busta Rhymes and Game Of Thrones star Peter Dinklage for Doritos Blaze. Set to air during Super Bowl LII this Sunday on February 4th, the must-watch lip-sync rap battle features Peter tackling Busta's verse from "Look At Me Now", while Morgan gives viewers goosebumps with his rendition of Missy's "Get Your Freak On." Both Busta and Missy play coaches to the duelling duo and make cameo appearances in this brilliant and bold ad. During Super Bowl Sunday, fans will have the chance to pick a team using an exclusive Snapchat lens, allowing them to record their own performance, inspired by the ad. You can watch this brilliant ad in our video box. This is the first nationally televised Super Bowl commercial to feature one company advertising two of its trademarks back-to-back. MTN DEW ICE is a clear and refreshing lemon-lime flavored DEW® and Doritos Blaze features a complex flavor and heat that builds as you crunch. This ad makes history as it is the first nationally televised Super Bowl commercial featuring one company advertising two trademarks back to back. Mountain Dew ICE is a clear and refreshing lemon-lime flavoured DEW® product, and Doritos Blaze features a complex flavour and tingling heat that builds as you crunch.